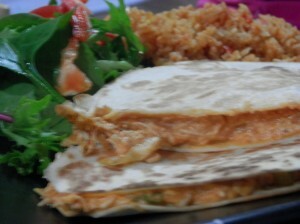 Side dishes like a tossed green salad and mexican rice are great with these quesadillas. Combine the chicken, sour cream, salsa, cheese and chilli powder in a large mixing bowl and stir to combine. At this stage you could place the mixture in a freezer bag, seal and label it and pop it into the freezer. Now I like to heat my mixture up a little in the microwave to make sure it is heated through and the cheese melts properly before I place it in my tortillas. Lightly spray or oil a frying pan and heat to the same temperature you would use for toasted sandwiches. Lay your tortillas out on a flat surface and divide the chicken mixture evenly between them. Place the mixture on one side of your tortilla only, leaving a margin around the edges. Fold your tortilla in half over the filling and place into the frying pan to toast. When the underside has slightly browned, flip over to toast the other side. Serve with your favourite side dishes or on their own for a quick snack. Notes: You don’t have to use the fold over method, if you like you can just spread the filling over one tortilla and place another one on top, just like a toasted sandwich. Just be aware that when you cut it in half your filling may spill out.